By Paula Broadwell and Erika Cashin. On Veterans Day, our nation celebrates the less than 1% of our population who have served in the greatest military in the world. Of the 21.9 million veterans, 2.2 million are women. Today, over 9% of the US veteran population, is comprised of women. We are now the fastest growing sub-population among veterans, but still often feel invisible in our communities. Women have given their lives and supported the military mission in some fashion since we became a nation. Our culture - represented in the news we read, Hollywood films we watch, and even the imagery we find on Google - seem to lead citizens to overlook these critical contributions women have made to national defense. Examples of this tendency are still found throughout our society today. In media outlets, an overwhelming majority of recognized veteran subject matter experts on military and national security news are men, not women. Over the past decade, most stories about women in the military are minimized to narratives of sexual assault, rather than balancing coverage with our many success stories. In Hollywood, blockbuster military-themed films overwhelmingly feature male protagonists. And a Google search for "Veteran" images returns dozens of pictures of men in uniform before a staged photo of a woman surfaces. We all have a personal story of having to validate our service when we shouldn't have to. Some are asked when parking in a spot "Reserved for Veterans" at the grocery store if our husbands served. Others have been asked to provide military status documentation to flight attendants when military are called to board. When we volunteer that indeed we served (some of us for 20 years), the wide-eyed reaction reminds us of our need to increase our visibility. In true military fashion, we are facing this challenge head on, and with a positive message. We aren't going to let society's current stereotype of our veteran force continue to misrepresent us. We will change this by asking our friends, neighbors and networks to start "seeing" us as veterans. 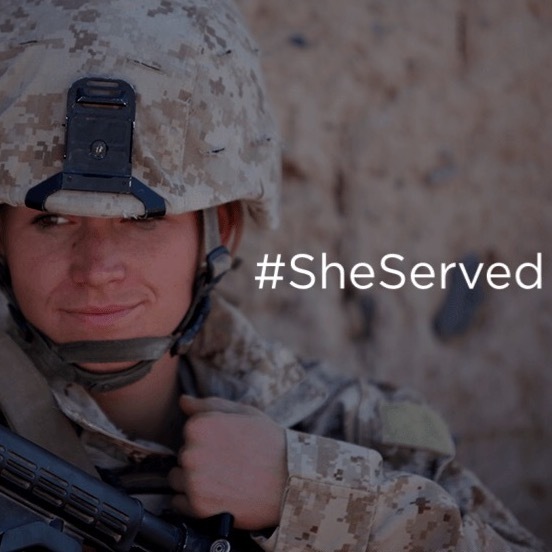 We ask you to join us in celebrating women's service in the same way we honor men who serve. Why do we need to do this? Why is it important for our society to recognize and promote our sisters in arms? First and foremost, we need to do this to honor those women who blazed a trail for us, and second, to provide a message of inclusion for our daughters, and each young woman in America, so they see our service begin respected. While in uniform, we collectively made the military more effective through our diversity, unique skills, and resilience. And after service, women veterans continue to positively contribute to our communities. A higher percent of female (vs. male) veterans are employed. Women veterans have higher median household income than women non-Veterans. A higher percent of women veterans earn higher education degrees and are enrolled in higher education compared to male veterans and female civilian counterparts. We also volunteer more often than men, at a rate almost double our current service participation of 16%. And these trends are likely to become more obvious in the coming years. According to the Department of Veteran's Affairs, female Veterans are on average younger (49 vs 64 years for men), healthier, and live longer. Of course, as a sisterhood, we also face challenges our nation's veterans have never before seen. More veteran women are widowed compared to our civilian counterparts. A higher percent of women veterans have a service-connected disability, have no income, and experience poverty more than male veterans (though we fare better than civilian women in these areas). Women veterans are also more likely to be homeless than our male counterparts, and seven times more likely to commit suicide than women that have not served. One in three women in the service will have experienced sexual assault. VA studies also indicate 36.6% of military women suffer from domestic abuse. Yet if one can find a silver lining, these unfortunate statistics serve to highlight the resilience among women who have served. We know how to pull ourselves up by the boot straps and carry on when tragedy strikes. We succeed when faced with adversity. We adapt and overcome. And quite often, we do this as a sisterhood, and our sisters in arms provide needed assistance and support. Now we're looking for our communities to do the same. Lack of awareness of female veteran challenges and hidden bias towards women brought our two organizations (Lean In Women Veterans and Think Broader Foundation) together to change the narrative as well as raise the profile of our sisters in arms, who continue to be our sisters after service. 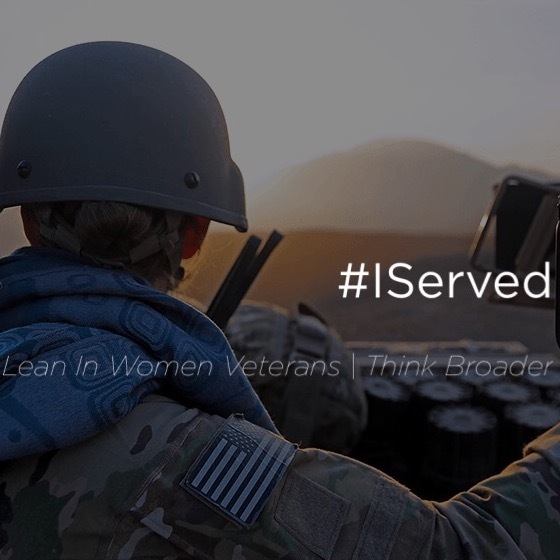 We asked women from all services, all ranks, and all wartime eras, to send us a simple "I Served" selfie video. The response was overwhelming and powerful. We hope these images will not only inspire you, but they will also move your heart to see the pride in service exhibited -- from a World War II Army nurse who served in northern Africa, to a 95-year old Air Force vet, to a Marine Corps bugler. The imagery includes the first U.S. military woman to summit Mt. Everest, one of the first female Rangers, single women in command of military units abroad, and moms in command of their toddler "troops" at home. We ask you to join us in celebrating the millions of women in your respective communities who are now serving as teachers, musicians, doctors, bankers, running non-profits or city councils, and beyond. We ask you to think broader about our veteran population and see women as an important part of that fabric. Whether helping women transition to civilian life, or working to promote a more accurate and inclusive depiction of those who have served, we encourage you to join us and simply recognize the breadth and depth of talent among us. We do this while also encouraging increased connection within the communities where we live so we can ensure the successful reintegration of our nation's veteran force.